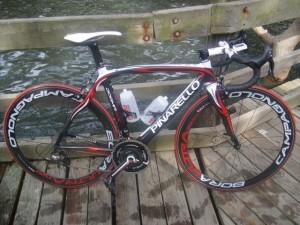 In 2011 Team Lotto will race on the Black-Red-White Pinarello Dogma and they will train on the White Paris. 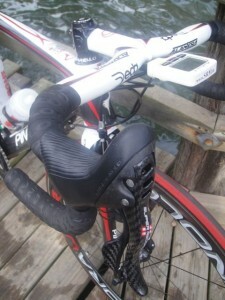 The Pinarello bikes will be completed with Campagnolo group-sets, Deda handlebar and stems with Campagnolo wheels. Rochelle’s complete bike weighs 6.815kg ready to race. 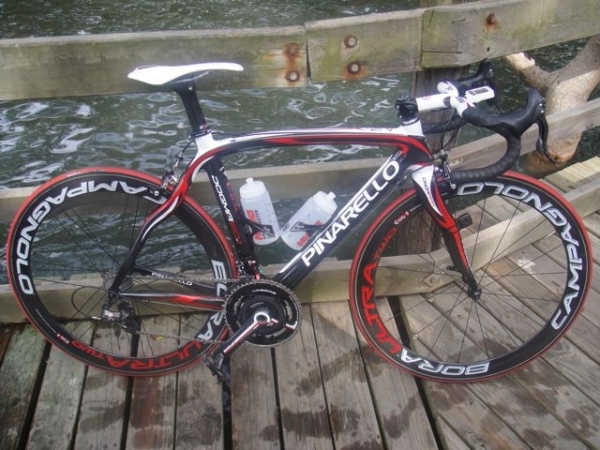 DOGMA 60.1 is Pinarello’s great new idea for 2011 – the beginning of a new generation of frames that will revolutionize the concept of racing bicycles. DOGMA 60.1 is the first completely asymmetric racing frame. The parts on the right side have different shapes and sections than the parts on the left. 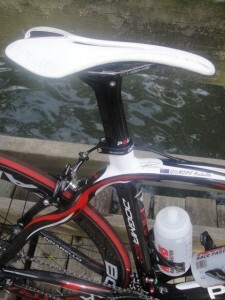 This is a true innovation in the cycling world and the point of no return for fans of extreme performance. My SRM PC7 tells me the truth. I’ve tested many alternative power measuring devices during the past 10 years but I haven’t found any other device that I can trust. I believe in my SRM PC7 every day, whether I see numbers that I like or numbers that I don’t like- I know that they are honest and accurate! Training to power is the only way to accurately measure one’s development. If you’re training to heart rate or taking times there are too may outside influences that can disguise one’s honest achievement. I won’t bore you with the details. If you want to know how hard you’re working or how much progress you are making, or how strong you actually are- you need an SRM! Once a week I give myself a true test to see how much power I can produce – first I will test my 1 second max power, and then I’ll test my30 second power before completing a gruelling training session – I usually do this test on a Tuesday afternoon after a day and half recovery. I try to keep my routine on a Monday and Tuesday the same without too much variation that could influence my power output on a Tuesday afternoon. If my body weight is down or up it will relate to my power output. These are my favourite power tests, I love trying to hit a maximum 1 sec power, I can reach 1000 watts (at 56kg) on my good days by coming off the wheel of a training partner or a motorbike at speed, or by rolling down a hill before applying explosive pressure on a slight rise. It’s a great feeling – pulling on the bars while concentrating on pushing and pulling as hard as possible on the pedals – and sometimes letting out an uncontrollable grunt! I can check my max power by the press of a button so I can get my feedback within 2 seconds of completing a maximum effort and the number I see will control my mood for the rest of the session. The SRM PC7 always assists my training sessions because if I see a high max or a PB (personal best) I’m on fire for the rest of the session. If on the other hand I’m given a poor power output reading, it makes me angry and aggressive for the rest of the session, that’s when I abuse my bike and body by ripping into the efforts with pure aggression! The other test I do is a 30 second power effort. I do this test on a consistent slight rise and I start in the saddle, slightly over geared. 20 seconds into the effort I stand up on the pedals and sprint, but it’s an over geared sprint. This effort sometimes leaves me with lactate levels of over 20mmol, blurry vision, nausea, pressure headaches and burning muscles. It’s all about the numbers, every second of effort equates to every extra watt of power produced. 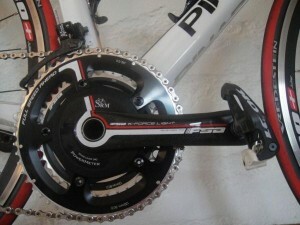 During the 30 seconds I’m thinking about watts and the numbers I want to get from my PC7. I have a program/software on my computer that will give me instant numbers for my best 30 seconds in the session…for 30 seconds I like to see an average power of over 650watts. My PB for 30 seconds (at 56kg) is about 680watts. No one does PB’s everyday but my Tuesday’s are all about numbers and this is when my SRM PC7 tells me the absolute truth about how strong I am from week to week! How would I really know how strong I am without my SRM?